In December 2005 the Ontario Power Authority (OPA) produced Supply Mix Advice for the province’s Minister of Energy. With 2015 reporting now significantly complete, and threats of a new Long Term Energy Plan being developed, it’s worth reviewing the 2005 plan to the 2015 actuals. Figure 1.1.1 of that report contains both capacity and generation figures for 2015. This post originally appeared on my tumblr account last Friday night. I’ve flipped through a slide deck Ontario’s electricity system operator, the IESO, has posted prior to insiders meeting March 23rd to discuss how the market should be manipulated in the future. I’m going to run off some comments on the Preliminary Outlook and Discussion: Ontario Supply/Demand Balance to 2035 slides here. That first point may sound flip, but if anybody detects a hint of the implication a market signal could trigger economic actors to enter, or exit, the market for electricity generation in the province, please let me know. For me the headline is this is a central planning document which would go nicely with a call to return to a unified public Ontario Hydro model. After 14 years Ontario neither has a competitive market nor does it demonstrate any learning of what that is and how it might be accomplished. First, for no particular reason, I’ll note slide 23 – which struck me due to its display of possible emissions, including those from imports. Ontario almost exclusively imports from essentially emissions-free Quebec. In addition to today’s healthy trade, anti-nuclear activists continue to tout Quebec imports as an option to replace the Darlington Nuclear Power Plant. I’ve written Ontario’s electricity future isn’t this Quebec Diversion, and this chart indicates the IESO is open to imports from elsewhere to meet much smaller needs than Darlington’s closure would necessitate. Cap and trade will provide endless reasons for interest groups to lobby Queen’s Park for access to the many exemptions and potential political favours embedded in the legislation. The annual silliness of Earth Hour has passed in Ontario. It was from 8:30 – 9:30 p.m., perhaps because that is when demand is dropping anyway. The system operator posts “Realtime Constrained Totals” that show “Ontario Demand” every 5 minutes. I pulled the data for tonight from 8 to 10 pm, as well as the same data for the previous three Saturdays. Obviously there are factors driving the differences from one Saturday night to the next, primarily temperature, but the trend is similar each Saturday night. Earth hour’s arrival is apparent, as demand drops 1% uncharacteristically (from interval 6 to interval 7). The drop doesn’t persist for an hour though – there’s even an uncharacteristic rise in demand during 2 intervals in the hour, as people appeared to tire of the heavy burden (that most of us took no interest in bearing to begin with). The first half hour the drop in demand was larger than it had been the previous 3 Saturdays, but the second half hour demand rose, whereas it had dropped significantly during the same minutes the previous 3 Saturdays. Throughout Earth Hour Ontario was exporting over 2,200 megawatts to Americans while the market rate was about 1.3 cents/kilowatt-hour (kWh). The system operator reported the average price of electricity generation in Ontario was 8.3 cents/kWh in 2015, which implies losses on exports of about $150,000 during earth hour. The IESO has announced the contracting of more variable intermittent electricity. 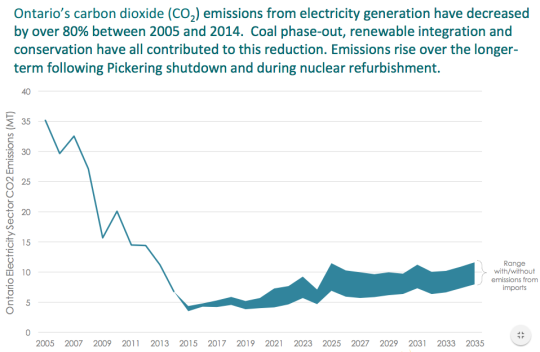 I am working on a post for my main blog that evaluates the value, and cost, of Ontario’s move off of coal, as well as it’s Green Energy Act facilitated mass contracting of industrial wind turbines and solar panels. From the template I’ve done for that post, I evaluated the implied carbon costs of this latest procurement.